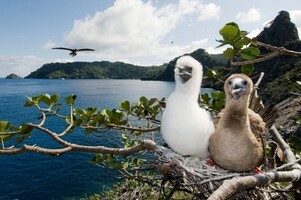 Two young avian residents of the fabled island were captured by the lens of the artist. Edward Herreño, a marine biologist and photographer, is the artist whose works will be displayed beginning Saturday at The Hidden Garden Art Gallery in Liberia. The show is the product of some 5,500 hours under water around Isla de Cocos, the country's distant national park in the Pacific. Herreño uses video in addition to still photography. International Airport and is open Saturday from 9 a.m. until 3 p.m. The show continues through Dec. 4. Said Carlos Hiller, the gallery's artist in residence: "Edward was born in Colombia and after graduating as a biologist set out to find the perfect, utopic place, the 'Island.' Now he has a mission to share this beauty captured in pixels, which permeate our own retinas with these powerful images. His mission also has the urgent purpose to create the awareness that this beauty is now threatened because the human hand reaches the most remote places."